some have been enjoyed from as far back as the 17th century. Prescribe dance instead of drugs GPs are advised by health chiefs. Family doctors are being urged to take up "social prescribing" after research found it cut GP visits and trips to A & E units by more than a quarter. The music is normally CD's and led by a caller. the atmosphere is informal with emphasis on friendliness and enjoyment. with a break about 9pm of about 20 minutes. We do not have facilities to make hot drinks. Water is available in the dining room, but no cups. On London road turn into Borrowcop Lane and almost immediately take the left turn into Kings Hill Road and go up the hill. You will pass a leisure centre on right and all weather pitch on your left. Turn into parking area on right after the last building on the right (beware of a red barrier post) and you will see tennis courts beyond this. Park either on visitor’s car parking area or on the tennis courts. The entrance to Bader Hall (main school hall) is quite difficult to find . If you stand at entrance to tennis courts with courts behind, look for a double door in building to your left. Go through doors and up the stairs. At the top of stairs go left and through wooden doors to a corridor. Bader Hall is now on your left! If you are new to Folk Dancing please look at the Steps & Figures Page to get an idea of what you will be doing, if you come to the club. We now have a Facebook group - if you would like latest news about the Club and updates, please contact us, asking to be our friend. The HEALTH aspects of Folk Dancing. Overall fitness - Folk dancing is the perfect exercise. It combines all the positive aspects of intense physical exercise with none of the negative elements. Folk dancing is a low impact activity requiring constant movement and quick directional changes that keep the body in shape. It tones the muscles without causing injury. Cardiovascular conditioning - As with all regular exercise, folk dancing can lead to a slower heart rate, lower blood pressure and improved cholesterol profile. Strong bones - The movements of many folk dances can strengthen weight-bearing bones and can help prevent or slow down loss of bone mass (osteoporosis). 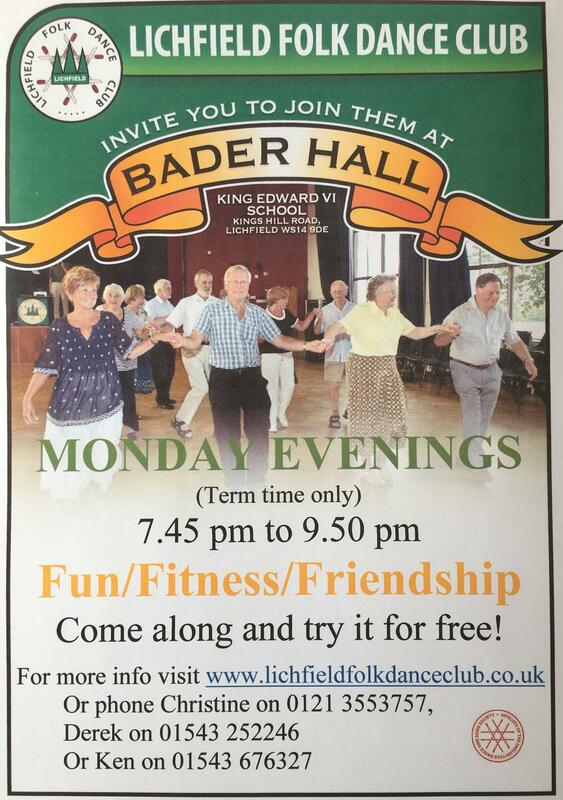 Burning off calories - Folk dancing can burn off as many calories as a brisk walk. An hour of folk dancing can burn between 400 and 800 calories. It's a mental challenge - Modern folk dancing is a mental challenge. Calls have to be remembered. Reacting quickly to the folk dance caller keeps you mentally on your toes. Whilst concentrating on the moves you escape from your worries and every-day pressures. It's an antidote to depression and loneliness - Folk dancing contains a social component that solitary fitness endeavours do not. It is very tactile, and friendly which contributes to self esteem and a positive outlook. Rehabilitation - When recovering from heart or knee surgery folk dancing is a positive alternative to aerobic dancing or jogging. Laughter - Folk dancing is full of fun - laughter is the best medicine! "English Country Folk Dancing is Fun and Friendship set to music"